Common, permanent resident of low and middle elevations the length of California. Replaced by Gambel's quail in southeastern deserts. Found in shrub, scrub, and brush, open stages of conifer and deciduous habitats, and margins of grasslands and croplands (Leopold 1977). Feeding: Feeds primarily on legume and other seeds; also on green vegetation, arthropods, grains, and fruits. Forages on ground and low vegetation. Scratches, gleans, grazes, and browses; jumps to pick seeds, blossoms, and fruits. Searches and pounces on arthropods; rarely flycatches. Seldom ventures more than 15-30 m (50-100 ft) from cover to feed. Chick eats large amounts of arthropods. Cover: Brush and trees provide cover for feeding, escape, movement, and roosting. Reproduction: Nests in a small depression in ground, lined with grasses and forbs; nest hidden in herbage among shrubs. Water: In cool weather, probably can meet water needs from succulent plants, arthropods, and dew. In hot weather, requires free water daily. Able to use mildly salty water (Brush 1965). Gathers near water in dry weather, and disperses when green vegetation and water are abundant. Pattern: Requires a mosaic of low, brushy vegetation, with grass/forb openings, taller shrubs, and trees, interspersed with water. Seasonal Movements/Migration: Not migratory. Winter movements usually encompass twice the area used in summer. Covey may disperse in spring up to 8 km (5 mi). Home Range: In California, winter home range of 4 coveys averaged 10.5 ha (26 ac), and varied from 6.9 to 18 ha (17-45 ac). Pairs foraged daily over 4.9 to 10 ha (12-25 ac) before incubation, and 1.2 to 4 ha (3-10 ac) during incubation. Broods used only a few acres the first 2 wk, and 4-8 ha (10-20 ac) by 1 mo. Occasionally a brood moved 1.6 km (1 mi) from nest to brood range. In nesting season, unmated individuals may wander. Territory: Includes the immediate vicinity of female (Sumner 1935, Genelly 1955). Unmated male may establish a calling territory adjacent to a breeding pair. Reproduction: Forms pairs from March to early May; nests April to August, with peak in May and June. Clutch averages 14 eggs (range 6-16). Most nests hatch in June after incubation of 23 days (Johnsgard 1973). Female incubates while male remains nearby. In favorable years, female may renest while male cares for first brood (Francis 1970). Young precocial; brood remains together through winter, or joins others. Niche: Predators include Cooper's and sharp shinned hawks, great horned owls, many snakes, ground squirrels, domestic cats, coyotes, skunks, bobcats, and jays (Sumner 1935, Glading 1938). Numbers and breeding success greatly affected by rainfall; high numbers usually follow years with high winter rainfall and abundant forb crops (McMillan 1964, Francis 1970, Leopold et al. 1976). Raitt and Genelly (1964) found productivity correlated with a minimum of fog and rain during nesting period in Alameda Co. Francis (1970) suggested that productivity was a function of 3 variables, in decreasing order of importance: (1) high soil moisture in late April, (2) proportion of breeding females over 1 yr old, and (3) abundant seasonal rainfall September to April. Brush, A. H. 1965. Energetics, temperature regulation and circulation in resting, active, and defeathered California quail, Lophortyx californicus. Comp. Biochem. Physiol. 15:399-421. Emlen, J. T., Jr. 1939. Seasonal movements of a low-density valley quail population. J. Wildl. Manage. 3:118-130. Francis, W. J. 1970. The influence of weather on population fluctuation in California quail. J. Wildl. Manage. 34:249-266. Genelly, R. E. 1955. Annual cycle in a population of California quail. Condor 57:263-285. Glading, B. 1938. 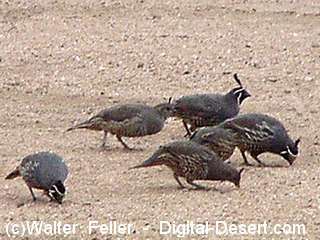 Studies on the nesting cycle of the California valley quail in 1937. Calif. Fish and Game 24:318-340. Leopold, A. S., M. Erwin, J. Oh, and B. Browning. 1976. Phytoestrogens: Adverse effects on reproduction in California quail. Sci. 191:98-100. McMillan, I. I. 1964. Annual population changes in California quail. J. Wildl. Manage. 28:702-711. Raitt, R. J., and R. E. Genelly. 1964. Dynamics of a population of California quail. J. Wildl. Manage. 28:127-141. Sumner, E. L., Jr. 1935. A life history of the California quail, with recommendations for its conservation and management. Calif. Fish and Game 21:167-256;275-342.ric., For. Serv., Reg. 6, Portland OR. 382pp. Mountain Quail has chestnut face, unscaled belly, and gray crown. Gambel's Quail lacks pale forehead, stippled nape and scaly belly.